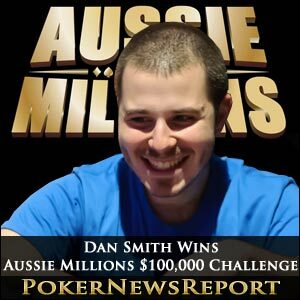 American pro Dan Smith took down the Aussie Millions $100,000 Challenge, the first high roller event in Melbourne’s Crown Casino, for $1,041,828 after seeing of the challenge of Russian Mikhail Smirnov in what became a drawn-out heads-up clash. The Muscovite left with $634,156 for his runner-up spot, while Lebanon-born Aussie Joe Hachem picked up $339,726 for third and Lithuanian-Australian Tony G collected $249,133 for his fourth-place finish as just four players cashed. Smirnov started his heads-up battle with Team LeggoPoker Pro Smith as a huge chip leader, with his 1,575,000 well ahead of his opponent’s 625,000. But, as the clash developed over the following 60 minutes, Smith closed that deficit, before doubling-up to take control. Smirnov, though, would not give up easily and then doubled-up to retake the chip lead as the pair battled it out for over three hours before Smith was crowned champion. When the end arrived, it was swift and decisive, taking just two hands to see Smirnov eliminated as runner-up. The first hand saw Smith double-up when his 6♥ 6♦ held against the A♣ Q♦ of Smirnov, before he finished off the Russian – who now held under 200,000 in chips – when his 2♦ 2♠ beat out his rival’s Q♥ 6♥. The board showed K♦ 5♥ A♣ J♣ 8♣ and once again the American’s small pocket pair held strong. Only 22 players paid the huge buy-in, compared to last year’s 38 – which saw Englishman Sam Trickett crowned champion – for a 42% drop, which is a bit discouraging. Team PokerStars Pro Daniel Negreanu and Jason Mercier, and JC Tran all paying the $100,000 entry fee. 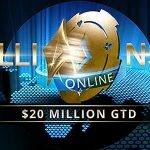 While none of the above six made it out of Day 1, eight-time WSOP bracelet winner Ivey did finish in ninth when losing out to Danish sensation Gus Hansen – yet another ex-Team Full Tilt Poker Pro. Vegas-based Ivey moved all-in with 8♦ 8♠ on a flop that showed 9♠ 7♦ 6♠ for two possible straight draws. However, Copenhagen’s Hansen, with 7♣ 6♦, had two pair and, as nothing changed on the turn and river, Ivey was out to leave us with a final table of eight. California’s Nam Le – a former Team Bodog Poker Pro – was the first to exit in eighth place at the hands of Hansen, while Nottinghamshire’s Trickett couldn’t retain his crown when he followed soon after as the Dane again brought about an elimination. Vegas-based Canadian Sorel Mizzi – the Titan Poker Team captain – finished in sixth when his Q♥ Q♣ lost out to Smirnov’s A♥ K♥ after a board of 4♣ J♥ 5♥ 4♦ 2♥ gave the Russian an ace-high flush and the chip lead to leave just one more exit before the money. It was the final table’s initial chip leader, Hansen, who finished as the bubble boy when his A♠ J♣ could not overcome the 10♥ 10♦ of Smirnov. Team PartyPoker Pro Tony G finished in fourth as his A♥ 6♥ couldn’t better the A♠ Q♥ of Smith, while Melbourne’s Hachem – who had fought hard to stay in contention – exited in third when his A♣ 9♣ ran into the eventual winner’s A♠ 10♠. Ex-Team PokerStars Pro Hachem – the 2005 WSOP main event champion – enjoyed a good flop of 9♥ J♠ 7♦ to hold top pair and that improved when the 9♠ arrived on the river to give the Aussie trips. However, while his supporters began to celebrate, the 3♠ river gave Smith a spade flush to steal the pot away from the former.